On Sunday afternoon, September 8th, join us at Unionville Vineyard for a great, late summer afternoon. You will find yourself in the beautiful rolling countryside of East Amwell while you munch on appetizers followed by a roasted pig with all the trimmings while sipping a fine flight of wine, sampling and tasting Unionville Vineyard's award winning whites and red in a beautiful commemorative wine glass. The wine glass is etched with the 300th logo and is yours to keep. A DJ will play your favorites in the background as you stroll the vineyard, tour the winery and then enjoy a very special barrel tasting offered for the first time by our official winery of the 300th. As the sun sets, a fire will be lit, and the marshmallows will come out as we roast them and make our own s'mores - a gooey, decadent marriage of toasted marshmallows, chocolate and graham crackers. One of the great accompaniments chocolate may have is that of port wine. 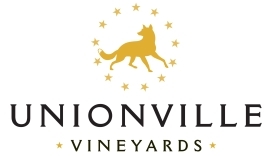 Unionville will offer glasses of their very special, highly award winning port at the fire pit as we watch the nature's spectacular show of orange and reds in the western sky. Yesterday morning's rain brought yesterday afternoon's mud to the Hunterdon Agriculture and 4-H Fair. It also brought tonight's bugs! Throngs of people came out to see the fireworks and walk the Fair in absolutely perfect weather. But the gnats and mosquitos enjoyed the fair, too! A few really smart people with forethought stopped by the Tricentennial table in the Community Services tent and purchased a "Bug Ban" for $3.00. Our non-toxic writs band brandish a gold embossed 300th logo as well as a pleasant scent that mosquitos and gnats find unpleasant. The wrist bands last up to 40 hours outside a sealed bag. So you can purchase one, garden for a couple of hours or walk around the Fair and then seal it in a ziplock bag and reuse it over and over again. Pick one up at the Fair tomorrow or Sunday.... it's great for the last barbeque weekends of Summer, fall clean up, or apple picking on a warm fall afternoon. Meanwhile, the 300th has our monthly Saturday morning meeting tomorrow morning -- we're making the big push to fill up and finalize the calendar for 2014, finalize our fundraisers in 2013 and start working on our March 22nd Birthday Parade! Very exciting day today! 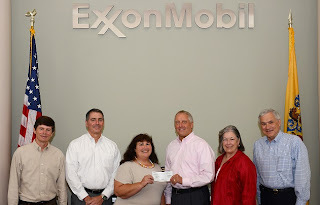 The Hunterdon County Tricentennial Committee was presented with a $25,000 check by ExxonMobil in Annandale. Emil Jacobs, Ph.D., vice president of Research and Development for ExxonMobil, who presented the $25,000 check to Hunterdon County Tricentennial Committee Chair Marcia A. Karrow and Vice Chair Catherine McVicker, stated that “the variety of events, activities and lectures shows the depth of Hunterdon’s rich history and the commitment by the Tricentennial Committee volunteers to honor that history. ExxonMobil and its predecessor companies have a long history in the County and we are very pleased to support Hunterdon’s major milestone. The ExxonMobil Technology Center is proud to call Hunterdon our home.” Jacobs was joined by Chuck Darnell, manager of Research and Development Support Services, Ken Del Rossi, manager of Process Technology and Jeff Morrison, business advisor for Research and Development Support Services. Opened in 1983, the ExxonMobil Research and Engineering Company Technology Center in Annandale pursues a wide range of research activities from basic science to advanced engineering. Researchers, technicians and engineers are exploring the fundamental science behind next generation fuels and vehicles, developing new technologies to improve the safety and efficiency of ExxonMobil’s operations, and building new methodologies and capabilities to support these efforts. Come See Our New Commemorative Woven Cotton Throw at the Fair! If you have a chance this week, stop by the Hunterdon Tricentennial Committee's table in the Community Services tent at the Hunterdon Agricultural and 4-H Fair. Not only do we have t-shirts and other items for sale, on display is a sample of our beautiful new woven throw. The throw, made of 100% cotton here in the USA, displays 9 of Hunterdon's most notable historic structures and proudly lists all 26 of our municipalities. The price is set right to move this great commemorative and practical blanket at just $35.00! and it comes in 3 great colors: navy blue (on display), hunter green and cranberry. Don't forget to tell your friends and family to sign up for our blog or other favorite choice of social media on our website. It will be the best way to get alerts for reservations and tickets to the dozens and dozens of events, activities, lectures and tours offered in 2014 for the 300th. Come and enjoy the delicious wine and pig roast at the Unionville Vineyards on Sunday, September 8th.